Dan Vigil gets a “love tap” from a Millwall Brick, courtesy of Lee Morrison. 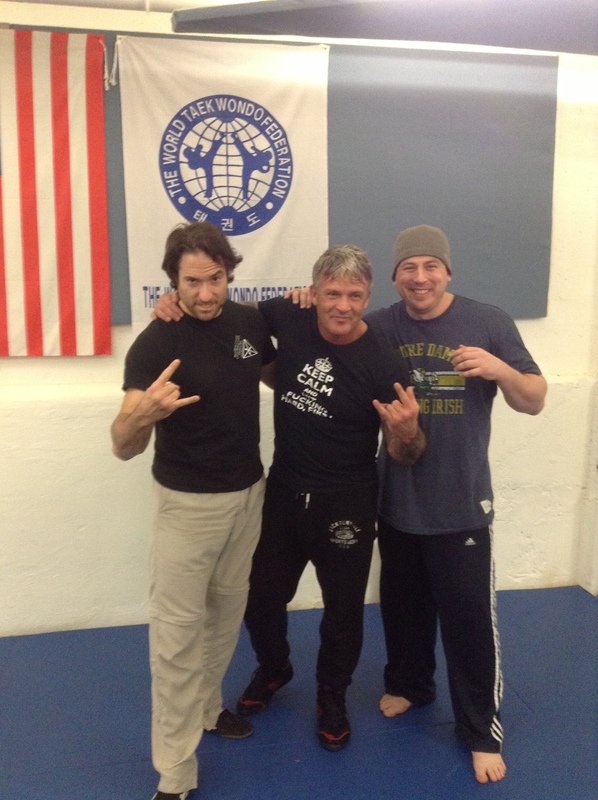 This past February, Dan Vigil hosted a three day combatives seminar with UK instructor Lee Morrison. Originally scheduled for last year, the seminar had to be rescheduled due to a training injury Lee received. Seeing in person how hard the man trains, this isn’t too surprising! I missed the first day of training, but Lee did his best to catch us up. The seminar began with going over the proper mindset needed for successful self defense, or what Lee calls combative psychology. 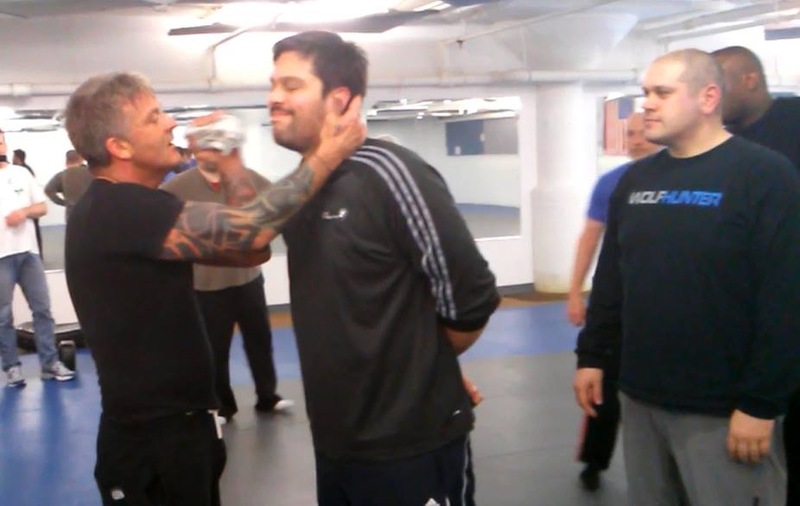 A lot of self-defense instructors teach their students to not become victims; Lee pushes that much further, and instead teaches how to become a worse predator than the one you will potentially face on the street. A lot of emphasis was put on proper mindset in three distinct stages: pre-conflict, during the actual fight, and perhaps most importantly, post conflict. Lee makes it his mission to help develop your inner predator, with an understanding that it doesn’t have to hang on your shoulders like a burden. Instead, it is something you tap into when you need it, and leave it locked away when you don’t. The structure of the seminar was interesting. There was a lot of downtime between actual physical training sessions, because Lee’s emphasis was on mindset, which required a lot of prepping us for the next training session, and some after action review post training. Lee’s approach was very module based; we would focus on a specific set of skills, recap, and then move on to more training. While there was a lot of classroom learning, when we were on the floor, it was all out, high intensity, and high impact training. Instead of waiting for trouble to come to you, Lee is all about preempting. As he put it: you hit f@#$ing hard, and even more importantly, hit first. We worked a lot of pad drills, both against a single target, and multiple opponents. The holder would give the trainee feedback. If your hit was judged hard enough to do significant damage, the holder would fade back and allow you to engage the next target. If your strike was full of weak sauce, then the holder would keep the target in play, and you would have to blitz in with multiple strikes before turning your attention to the next target. Other modules includemultiple opponent tactics, counter grappling/mma, and improvised weapons. Not much in the way of actual technique was covered. Instead, you used your preexisting skill set, and Lee focused his energy on getting the proper attitude and mindset, and working on developing power to all of your strikes. Lee talked a lot about how the guy on the street is going to be hitting you with hurt and anger, and you have to do the same to him. Emotional content, as Lee (both Morrison and Bruce) says. A few of the drills we did felt as close to a real fight as I’ve felt in a long time. This is where the training got really interesting, as one of the best takeaways from the Lee Morrison seminar was just how hard you can train, and still be ok. Having shorter training segments allowed us to really amp up the intensity, and and then be able to recover as we transitioned to the next topic.. The last thing that really stood out about Lee was how athletic and explosive he was, and how necessary such attributes were if you are going to train in his blend of combatives. In the UK, all weapons have been outlawed, which of course criminals could care less about. When you don’t have guns or knives to rely on for protection, your empty hand skills need to be at the highest level. Lee trains as hard as a professional fighter; spending hours every week hitting pads, and dedicating himself to a rigorous strength and conditioning routine. The athlete in me really appreciated this, and because of my day job, I am able to dedicate a lot of time to training. However, for those with far less free time to train, I honestly don’t think it would be possible to emulate Lee directly.However, between his combat psychology, and the intensity of his training, any student of self protection will get a lot out of training with Lee. Even if you don’t have the physical attributes to fight like him, you’ll still get a lot out of it. Plus, it might inspire you to make a bit more time to train. I would suggest that if you ever get to train with Lee, you bring your own training partner. That way, you can train as hard or as light as you want. Also, Lee really was one hell of a nice guy. I was able to go out to dinner with him and some of the group on Saturday night, and he was super cool, which makes training and hanging out with him that much more enjoyable.